Alright, this is just downright addictive. I Feel Like I'm Back In Kindergarten.......and loving it. I've never been much for fusing, but why not give it a shot, with some Oakshott Cottons. I've been wanting to do lots of skinny strips running through circles, for a while, but I've just been a bit lazy, I mean all that piecing. One of the reasons I don't care much for fusing is how stiff the fabrics often feel, but with the shot cottons being so light weight, I thought I would give it a try. How fun is this....I feel like a kid again! It reminds me of playing with bits of brightly coloured construction paper....I always loved that construction paper, so many colours, I was a colour junkie way back then. They usually tell you to pre-wash before fusing but that's not going to happen around here, there's that lazy gene again....you know the one that stops me from mending. The instructions said, I could just iron the fabric with a steam iron so that's what I'm doing. I'm not really worried if things don't adhere perfectly, since there will be some heavy quilting involved ...I think. Bethan Ash's fabulous book Vibrant quilt collage arrived in the mail this week and gave me the push to go downstairs a play for a little while this evening. I'm so glad I did. The long arm is partially fixed....I have speed control again. Unfortunately the stitch regulator is not working now, not that I use it much, but it would be nice to have everything up and running properly. I thought I would just take it for a little test drive. For the upcoming week, I have a few projects, I would like to tackle. Curtains I promised to finish for my little grandson....he's almost five months old, yikes!!! My Free Bee block for September. Pick out fabrics, for a baby quilt, for my little Autumn Claire. So time to focus....no more putting up design walls, for the moment that is. Oh, and did you notice the mending didn't even make the list. In keeping with my belief, that our homes should serve us, rather than the other way around.....I'm making some changes. Here is the TV area that nobody ever sits in. Our needs change as our families grow. When we first moved into this house about 12 years ago, our two daughters still lived with us....now it's just my husband and I. We prefer sitting upstairs, where's it's brighter and warmer, even though there is gas fireplace down here. These open concept houses can be a pain to heat in our cold Canadian Winters. Besides, my husband turned one of the rooms on the main floor into his man cave and the TV up there is bigger....that says it all doesn't it..... I mean men and their TVs. Here sits a lonely pool table that gets used a few times a year for an actual game of pool. Oh, and we did eat Christmas dinner down here last year....that works really well. I use the pool table on a regular basis for laying out large projects etc. but the problem with pool tables is that they take up so much space, in order to actually play pool. Did I mention I've already taken over the two downstairs bedrooms?? I even set up a kids corner down here for my little grandchildren...but they are still to young to play down here alone. Some switching of rooms is going to happen....I think. The whole gallery type design wall is so addictive. Thinking it would be nice to make a large black one, I bought some black felt instead of batting and it seems to work quite well. Plus the felt was half price....I just can't resist a good bargain. The fabric doesn't stick quite as well to the felt, as it does to the batting I usually use, but the black is just so striking. It will be a great place to display finished quilt as well....but they will have to be pinned in order to stay up. Projects look so different on a black background. Maybe I'll make that one panel bigger....no sense wasting any wall space. My next step will be to remove some of the bulky furniture, from the seating area and bring down my computer desk....then the majority of the toys can go up to the room where my computer is now. I hope some of that makes sense. I get tired just thinking about this, but I've been mulling over the idea for some time. I'll keep you posted if I actually get at it. When you're a multiple project type quilter......what does one do with all these ongoing projects?? Putting them all away in a bin doesn't work all that well for me. You know that old saying "Out of Sight...Out of Mind". That's exactly what happens when I pack things away, out of my line of vision. My answer to this is....more design walls. We'll see if this actually works. I have a fair bit unused wall space around my long arm...so I thought, why not put up more design boards. I often like to let projects sort of simmer, but if I put them out sight the simmering process sort of stops. Now, I'm not really using these, as working design walls.....rather I'm using them more, as display walls, to keep me engaged. I have a working design wall right next to my sewing machine but I only like having my most current project on it. I might just have a few more empty spots in this room to put up a few more....what can I say, I really do have a tendency to get carried away. But really, can one ever have too many design walls ??? And last but not least....a new addition to our family. My little granddaughter, Autumn Claire arrived this week. She was more than a week overdue, but was born on my son's birthday...how lovely is that. Just what are my thoughts, on working with solids anyway?? Good question..........for me, as with most aspects of quilting, it's a process. I've had a love affair with colour and pattern since childhood. But, the availability of colour and pattern was much more limited when I made my very first quilt....in the early seventies. Little country florals, gingham checks and poly cotton broad cloth in pastels or primary colours was about the size of it. Yup, red, yellow and blue. The kids wore the thing threadbare, but I never could get that excited, about the fabric. Now the seventies were full of amazing graphic type prints...just think retro, all of you younger quilters, but they weren't available in quilters cottons. And the solids were very limited....the thought of finding 100 different shades of solid colours was something of a dream. Now I imagine there were quilters, out there, dyeing their own array, of hand dyed cottons, but I was unaware of them. Those were pre-internet days. I didn't get a copy of Nancy Crow's Quilts and Influences into my hot little hands, until the early nineties. What I saw, blew me away, but finding the kinds of fabrics I wanted wasn't that easy. I would see work by Kaffe Fassett and wonder...... where will I ever find such brilliant fabrics. Neons were all the rage in the eighties but that is not what I meant by brilliant fabrics. Kaffe Fassett's book Passionate Patchwork was first published in 2001. I would see those shot cottons or striped wovens and literally drool with envy. About ten years ago a I stumbled upon some of them, in my local quilt shop for half price....I believe that's the first time the words "I'll take whatever is left on the bolt" came out of my mouth. No, actually that's not true....I worked in a large fabric store for about five years in the late eighties. That's when the addiction to fabric really started. I'm starting to get a little off topic as I ponder my process, of getting where I am today. I really should hunt through hidden cupboards and old photos and put together a chronological photo album of my projects...that could be interesting. My point is, with the increased availability of solid or solid like fabrics, my thinking, on what I can do with them, has changed. In the past, I thought of solids as secondary, to the printed fabric. How many times have you heard the advice, to choose one print you really love and pick solids, from that fabric to coordinate or dare I say, to match? This same advice is given in the home decor world....a jumping off point or focal fabric. In the last little while, I'm finding my stash of solids growing and my desire, to have them be the focus, rather than the prints, growing as well. The fact that I can go online and order every possible shade, of solid fabric, isn't hurting my cause one bit. For me, something interesting happens, when the ratio of solid to printed fabric increases.....I have to create interest with the solids themselves. It's like I'm creating my own printed fabric, using solid fabric. My solids are like tubes of paint, to do with what I will. To add even more interest, there are many, many, available texture type prints as well. Creating interest, with solids and a little bit of texture and print thrown in. 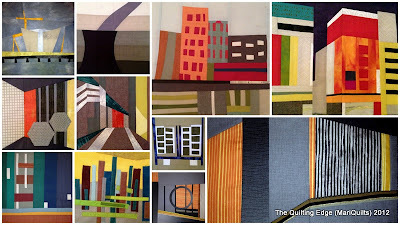 A collage of Bee Blocks made for me, by all the talented quilters in the Free Bee. It's almost like we are painting and telling a story, with our fabric. The only prints are texture types. A much more graphic design is created here, again, using mostly solids....I've added another layer of texture using applique. So it's not only fabric we have at our disposal, but different techniques as well. Just as a painter uses different brush strokes, we have many ways to incorporate our fabrics into a quilt. Here is the back, of the above quilt, minus the appliqued strips....again we are only limited by our imaginations. We can make our own designs as minimal or intricate as we desire. I made this quilt a few years back, using the traditional drunkard path block....but I still have some stripes going on. I love using those gradient type solids...they seem to glow. Using solids, does seem to give it a more modern and graphic feel. My biggest challenge working with solids came, when Lynne asked, if I would be willing to make a quilt using the fabulous Oakshott Cottons. Not that the fabrics are challenging to work with, far from it , but this being, my first quilt made up entirely of solids....including the back and the binding. Help....no jumping off point, no focus fabric and no print to "pull it all together". I started by throwing the fabrics haphazardly, on the design wall....the little sample rectangles included. I had seen a small painting, of a circle with a few lines running through it, in a gallery window, as inspiration....so I just started painting with my fabric. One block at a time, I built the quilt.....quilting each block along the way. No sketches, no real plan each step in response to the last. I felt like I was riding a bicycle, without my training wheels.....look Ma, no hands prints. An exhilarating ride indeed. I have to admit, I enjoy working with fabrics that are not quite solid, such as shot cottons, fabrics that have an almost painterly quality or gradient type fabrics. And last of all, solids come in handy when one wants to make use of negative space....something I still need to tackle, I have a tendency of getting so carried away, that my negative space disappears. Oh well....it's a process.